A special release wine of which only one barrel is made each year – making approximately 288 bottles per year. A blend of around 50% of each variety, the wine is aged in a new barrique from the Burgundian cooperage of Dargaud and Jaeglé. To capture the fragrance and perfume of the cabernet franc, and the mulberry character of the merlot, the recent wines have been bottled after 12 months in barrel. A further 15 months of bottle-aging occurs before the wine is released. The wine is inspired by the beautiful wines of St Emilion, in particular Chateau Cheval Blanc. The intriguing fragrance and the elegant weight of these varieties make it a wine to linger over. 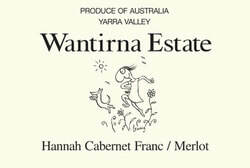 First made by Wantirna Estate in 1999, the age worthiness of the wine is gradually becoming evident.